Recently, National Medical Commission (NMC) Bill, 2017, which was approved by the Union Cabinet on December 18 was referred to the standing committee of the parliament. In this article, the following topics are discussed. 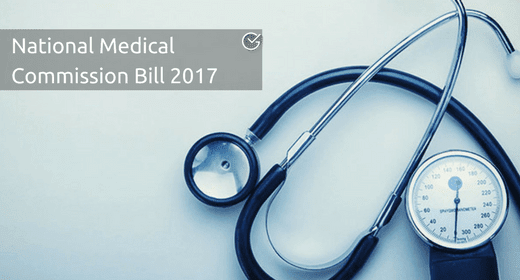 Why doctors are opposing the bill? Union cabinet cleared NMC (National Medical commission bill) to set up a new and transparent system of regulating healthcare and seeks to replace the Medical Council of India. 2. The Proposed National Medical Commission will replace Medical Council of India which is an elected body. Twenty members of the commission will be appointed by a search committee chaired by the Cabinet Secretary. The nomination will be done for 12 ex-officio and 6 part-time members. Three of these will be from disciplines such as management, law, medical ethics, health research, consumer or patient rights advocacy, science and technology, and economics,” he explained, quoting the draft copy. MAC will serve as the primary platform for states to put their views forward to the Commission. The Chairman of the National Medical Commission will also be the ex-officio Chairman of the Medical Advisory Council. As per the bill, The Council will have members nominated from every state and Union Territory and include the members of the NMC as ex-officio members. 5. The NMC will consist of four autonomous boards to look at different aspects of medical education, undergraduate, postgraduate, medical assessment and rating, and medical registration. 7. The Bill allows for a bridge course is also being instituted, to allow AYUSH doctors to prescribe allopathic medicine. Such a course will be decided in a meeting between the NMC and the Central Council of Homoeopathy and the Central Council of Indian Medicine. 8. The bill calls for once in a year joint sitting of the National Medical Commission, the Central Council of Homoeopathy and the Central Council of Indian Medicine will be held. The main aim of this joint sitting is "to enhance the interface between homoeopathy, Indian Systems of Medicine and modern systems of medicine". 9. The Bill proposes constitution of four autonomous boards entrusted with conducting undergraduate and postgraduate education, assessment and rating of medical institutions and registration of practitioners under the National Medical Commission. 11. According to the bill, the Ethics and Medical Registration (EMR) Board shall maintain a separate National Register including the names of licensed AYUSH practitioners. The names of BAMS (Bachelor of Ayurveda Medicine and Surgery) and BHMS (Bachelor of Homeopathic Medicine and Surgery) graduates are already registered with their respective councils. 12. The NMC has a provision that the government can fix fee for only 40% of the seats in private medical colleges. “No medical college will survive if there is a state-Centre dispute in the fee structure. 13. Section (15) of the NMC Bill makes a licentiate examination mandatory after acquiring MBBS qualification. This will be the first time such a provision is being introduced in any field of higher education in the country. Without qualifying the examination, no person will be enrolled in the National Medical register for practitioners and would be entitled to practice and do further postgraduate courses. India has less than one doctor for every 1,000 citizens, which is less than the World Health Organisation (WHO) standard that prescribes a doctor-population ratio of 1:1,000. The bill helps to increase the number of doctors in the country. Why doctors opposing the bill? 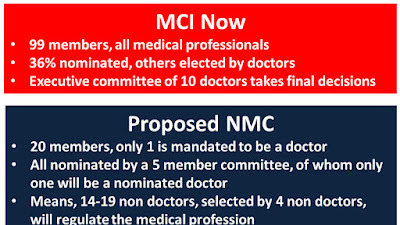 Doctors across the country protested the NMC Bill on grounds that it was “non-democratic” as it would replace an elected body (Medical Council of India, MCI) with one where representatives are “nominated”. Their other key concern was that the Bill paved the way for a backdoor entry of practitioners of traditional medicine into the domain of allopathic doctors.